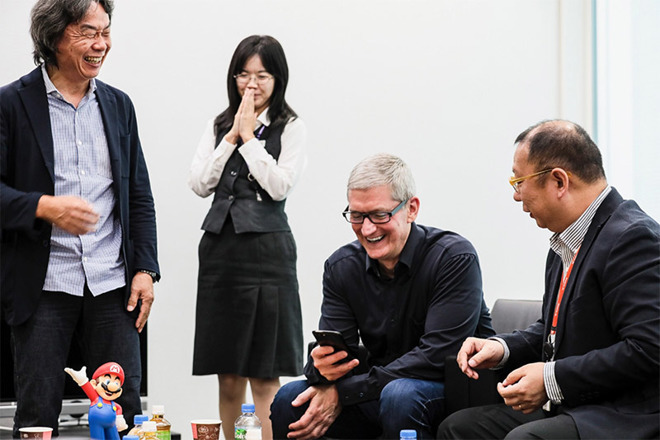 Continuing his East Asian tour, Apple CEO Tim Cook arrived in Japan this week and on Wednesday visited a popular shrine in Kyoto, met with executives from Nintendo and scored an early preview of Super Mario Run for iOS. At around 9 a.m. Japan time, Cook tweeted out "good morning" in Japanese, a routine for the CEO world-traveler who commonly uses the microblogging service to greet locals in their native tongue. A picture accompanying the message shows Cook and an unidentified woman walking through the famed torii, or traditional Japanese gates, at Fushimi Inari Taisha in Kyoto. Cook later tweeted a picture of a meeting at Nintendo, likely at the gaming giant's headquarters in Kyoto, where he is seen playing the hotly anticipated iOS title "Super Mario Run" with legendary creator Shigeru Miyamoto. Scheduled to arrive before the end of 2016, Miyamoto presented the game onstage during a surprise appearance at Apple's iPhone 7 event last month. Besides taking a first look at the most awaited iOS game of the year, what other business Cook plans to handle in Japan is unknown. Cook makes his way to Japan via Shenzhen, China, where on Tuesday he revealed Apple's plans to open an R&D center in 2017. Reported by local media yesterday, the upcoming facility is expected to foster hardware production and software developing talent in China's manufacturing mecca.